Last season I decided camo was too young for me. But you all thought it could be done. Here are two camo pieces, both inexpensive so all good if I tire of the look quickly (which I am suspecting will happen). 1 -- Knock-off Equipment camo shirt from Aqua (Bloomingdale's brand). Worn with Paige blue-black lightly coated skinnies and Rag & Bone Newbury booties; Amy Kestenberg backpack. 2 -- Reversible camo jeans (inside out is washed black) from Target. Almost identical to Sold jeans, well made for $35. 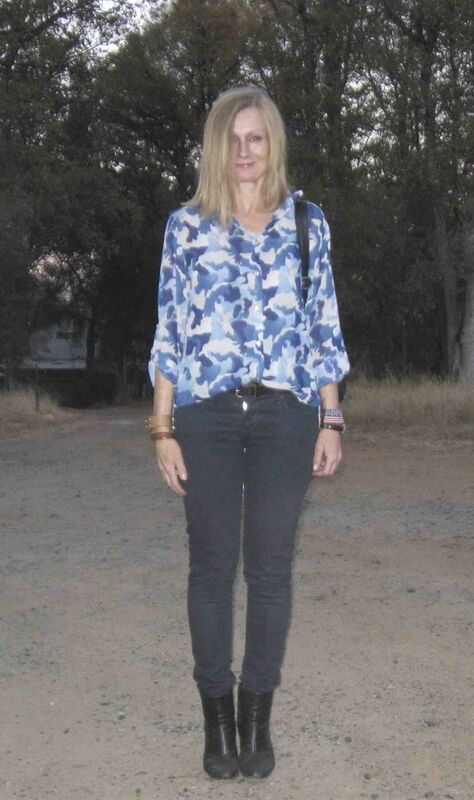 Here worn with a screaming quantity of potentially age-inappropriate elements: camo, skinny cropped skinnies, backpack, low rise of jeans, and logo graphic tee. I went to the grocery store in this and they did not offer me the senior discount in this even though it was senior discount day. Slightly disappointed not to save $2.50. 3 -- Is this a bit better with a plain tee? I liked the neckline better of the T Rex top but this might be a little less age inappropriate. 4 -- My government shutdown present to myself. Chan Luu American Flag bracelet. My boyfriend thought this was a hilarious excuse to shop. Thanks for looking. What about you, are you jumping on the camo bandwagon? The peep-toe bootie sandals are a few years old and have a 5" heel with one of those island platforms. Kind of dated but they work under these jeans which stretch out so in a few hours this outfit was a bit more PPL than pictured. The top is from last winter, Zara. It's thick sweatshirt material and quite boxy and cropped. The pea coat finishes things off, although I didn't need it. In the future, I need to pick tops that fit better under this coat. All the same I enjoyed wearing this outfit and plan to repeat this ensemble formula. Hello everyone! First I have to say if you happen to be watching the CBS evening news tonight (national edition), our restaurant will be featured in a story covering the economic impact of the government shutdown. I declined to be interviewed as my brother is better/prefers doing that sort of thing. 1 -- I love me a tonal grey outfit! Here worn with Angie's pick from NAS 2012, the sci-fi sweater. Coral necklace worn near my face to brighten things a bit. 2 -- I've been reaching for this formula for going on two years now, easy and haven't tired of it yet. 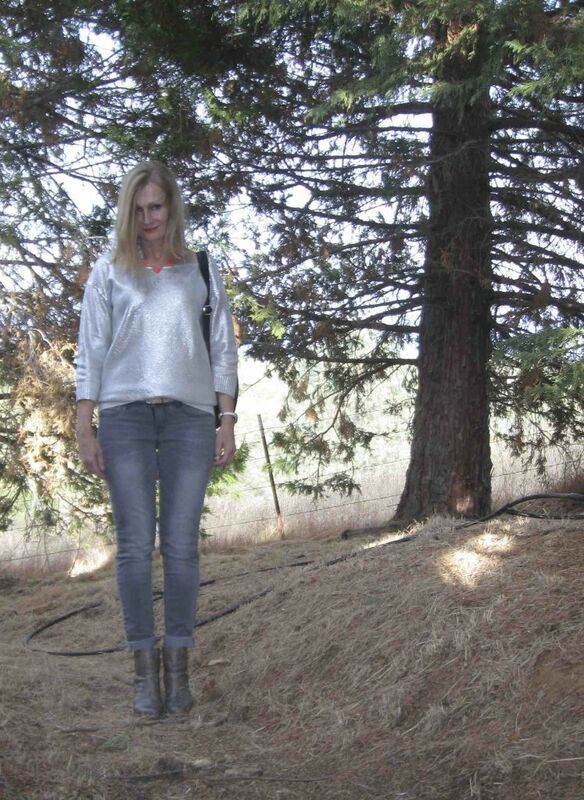 TR boyfriend jeans + Report Marks neutral booties. Here worn with a Breton stripe sweater from Zara and Bellatrix silky bomber jacket. I have a black belt on to tie in with the black in the jacket plus my black backpack works here well (I forgot to include it in #2 but you can see a bit of it in #1). For entertainment and educational purposes I am sharing some September WIWs. 1. Worn to dinner party in mid-September. 2. Wore this to work minus the heeled booties and backpack. I returned this B Brian Atwood Juliette backpack. Although I love, love, love the look of this I wasn't crazy about how it was constructed. When the bag was full it put too much strain on certain parts making me think the backpack would lose its shape unless I carried an extremely light load. 3. Settled on this Aimee Kestenberg backpack instead. MaryK and Adelfa helped me choose between the two in a parking garage in LA! 4. Outfit worn for lunch with MaryK, Adelfa and Rae in Burbank. 5. Easy all white outfit worn in my sister's spotless house in LA. There is a lot of dust on the ranch so it's harder to wear all-white. 6. Fashion sweatshirt I'm loving, worn in late September, sandal weather might now be over. Modeled on a skinnier day. Skinny jeans don't hide any sins do they? 7. Wore this to YLF meet-up. Not happy with how this came out! I had to get up early WITHOUT COFFEE to do some blood tests and forgot that I had previously styled this to better effect in a practice session (picture 8). But when I got up that morning, all I could think of was to wear this with these faded black skinnies. This Peter Som top has officially become an orphan. I purchased it in June but didn't wear it until the meet up. Do you have any ideas how to better style it? Thank you! And in advance, I apologize for the long thread but instead of starting a bunch of different threads I thought I'd do one. I really would appreciate styling advice for the Peter Som top.